UNITED NATIONS, February 23 -- At the UN World Food Program, it is a time of turn-over, and some say of spin. There are issues to be addressed: the looting of 450 tons of WFP grain in Guinea, Zimbabwe's Robert Mugabe government reportedly being on the brink of assuming vice-presidency of the WFP Executive Board, and outstanding requests to pose questions to James Morris, who is being replaced as executive director by Josette Sheeran Shiner. "reiterate the previous request to be kept informed of the travel plans, particularly to the UN's headquarters city, of James Morris, and of any press availability there might be. The same of Josette Sheeran Shiner -- do you know why she was unable or unwilling to take any questions before or after her recent meeting with Ban Ki-moon?" Josette Sheeran had a very busy schedule that day and cannot comment on WFP-related matters before she actually takes office in April. Mr. Morris will not go on any more field trips -- he probably will be in DC in mid-March. I have passed on the other questions to my colleagues in the field and will send you more info soon. When Jim Morris visited Zimbabwe in December 2006, it was reported that he would be leaving office at the end of the year, and that " Morris is happy to be retiring when the number of hungry people in Zimbabwe... is on the decline." That wasn't true then, and is even more false now. But in Mr. Morris' recent spin of selected press, no questions or answers on this have been reported. One of Inner City Press' questions concerns WFP's engagements with private corporations. In March 2006, Inner City Press inquired into WFP's drought insurance program with AXA, asking which other companies had bid on the WFP contract. Inner City Press was told this was "barking up the wrong tree." Click here for that article. In 2007, Inner City Press asked for an update, and the following arrived. Dear Matthew, here is an update on the drought insurance. In December 2005, WFP entered into the first-ever humanitarian aid derivative contract with Paris-based reinsurance company AXA Re. The contract provided for automatic disbursement of up to US$7.1 million in funding had a weather index reported significant drop in rainfall against historic averages and thus pointed to widespread crop failure at the end of the 2006 agricultural season. However, a severe and catastrophic drought of the magnitude of 2002 or 1984 did not occur in 2006 and no payout from the weather derivative contract was made. The 2006 production is the third good season in a row. Although official production and yield statistics are not yet available, forecasts indicate an increase in production over the 2005 season. Early verification of the rainfall index reveals that it faithfully captured events on the ground based on field reports made by Ministry of Agriculture and Rural Development extension officers, which served as a check on the index's performance. This first phase of the project focused on testing an innovative financial tool. The second phase will focus on developing a sustainable risk-management strategy, one component of which is to prepare an integrated financial solution for the three-year period corresponding with the 2008-2010 Productive Safety Net Program. This plan would make use of coordinated financial instruments tailored to different levels of risk, thereby providing comprehensive coverage and WFP will be involved in this process. Other development partners have also moved in the direction of securing and coordinating contingent funds and therefore developing a sustainable risk-management strategy for Ethiopia. 14 February, 2007 -- A fourth World Food Program warehouse was looted on Tuesday morning in Labe, central Guinea, resulting in the loss of 600 metric tones of rice, yellow split peas and cooking oil. The value of the food stolen is approximately US$500,000. This latest incident follows only two days after the looting of WFP's warehouse in Kankan, which resulted in the loss of 350 metric tons of food. In Pita and Dalaba, warehouses belonging to WFP's government partners were also looted, bringing total losses from the four incidents up to nearly 1,000 metric tones valued at around US$750,000. The food was intended for WFP's school feeding and food-for-work programs in the Lab� area. As a result of the looting, security has been reinforced in the remaining two WFP warehouses in N'Zerekore and Conakry, where 7,129 metric tons of food is being stored. Additional military guards have been assigned to the N'Zerekore depot. This food is for distribution in the Liberian and Ivorian refugee camps in Guinea's Forest region, where WFP is currently feeding around 15,000 people. On February 20, Inner City Press asked Security Council president Peter Burian about whether the Council will put the situation in Guinea on its agenda. Click here for video. On February 15, Secretary-General Ban Ki-moon stopped and took questions from Inner City Press and others about Darfur. Click here for video. How can it be that diplomats like Ambassador Burian, and even Ban Ki-moon, stop and take press questions openly, but Mr. Morris at the end, and Ms. Sheeran Shiner at the beginning, cannot? WFP's director will sooner or later have to answer. 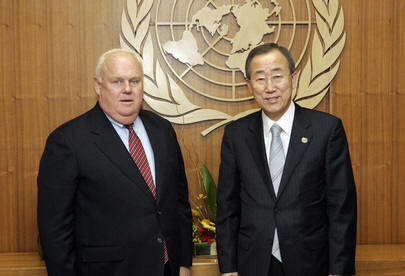 UNITED NATIONS, January 4 -- On the first working day of 2007, the new UN Secretary-General Ban Ki-moon showed up to work in New York. On the third working day of 2007, the new head of the UN World Health Organization, Dr. Margaret Chan, selected in November, showed up to work in Geneva, as the new U.S. Congress, elected in November, convened in Washington. And in Rome, seat of the UN World Food Program, whose new Executive Director Josette Sheeran Shiner's confirmation was rushed through purportedly because James Morris wanted to leave at the end of 2006, Ms. Sheeran Shiner was nowhere to be found. On January 4, WFP put out a press release listing James Morris still acting as executive director. But the UN's own news service of November 7 had announced that " Mr. Morris... remains in office until the end of the year" and that " Ms. Sheeran will take office at the beginning of 2007 as WFP�s new chief, the food agency said." So what changed? Thursday no one would say. It's as if the previous UN comments, including those used to rush through Ms. Sheeran Shiner's confirmation, never existed. But click here and see below. 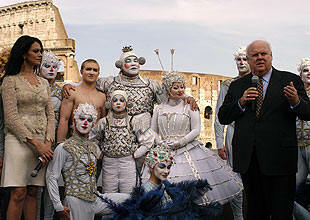 WFP's Morris with clowns in Rome - but where is Josette Sheeran Shiner? During the controversy in September surrounding Josette Sheeran Shiner's selection to replace James Morris as head of the WFP, Inner City Press was repeatedly told by UN officials that the reason for pushing to confirm Ms. Sheeran Shiner even in Kofi Annan's final lame duck months was that Mr. Morris wanted to leave WFP at the end of the year. This was offered as explanation for then-U.S. Ambassador John Bolton's conflicting position that Kofi Annan should make no appointments running past the end of 2006, and then his and the U.S.'s support for Josette Sheeran Shiner for a five year term. Inner City Press pointed out that Mr. Morris' term ran through April, and so there was no reason to rush through an appointment on a lame duck basis. But Inner City Press was told that Mr. Morris was leaving at the end of the year, hence the rush. Ms. Sheeran Shiner's confirmation was reported, by an affiliate of her old employer the Washington Times, as meaning she would start on the first day of January, 2007: Morris "will turn over the position at the beginning of 2007, four months before his tenure expires." Mr. Morris' December trip to Zimbabwe included reports that he was leaving at the end of the year: "World Food Program Chief Executive Officer James Morris was expected in Harare on Sunday for a final 24-hour visit before he retires from the post at the end of the year." In pre-Josette WFP news, Inner City Press asked the agency on Thursday about two situations in one country: Nepal. There are barriers to providing food to the rebels, pending disarmament; there are shortfalls in service to the Bhutanese refugees in the country. (Click here for a previous Inner City Press story about these refugees.) On Thursday morning, Inner City Press asked WFP in Rome and New York for an update on both situations, and was sent in response this Internet link. It's a nice site, but it's no update. What's going on? To be continued.